The Louisville Leopards Girls Varsity Basketball Team defeated the host Marlington Dukes 69-59 Saturday Night at Marlington High School. With the victory, Louisville improves to 12-5 overall and remains tied with West Branch atop the NBC Standings with a 10-1 conference mark. Sarah Lairson scored a team-high 19 points, grabbed a game-high 11 rebounds, dished out 4 assists, and recorded 3 steals to lead the Lady Leopards. Abby Beaver finished with 13 points to compliment her game-highs of 8 assists and 4 steals. Alexa Oberster also reached double figures with 10 points and pulled down 5 rebounds for Louisville. Marlington led 10-9 at the end of the first quarter, but the Leopards offense kicked into high gear with a 20-point second quarter to take a 29-25 lead by halftime. 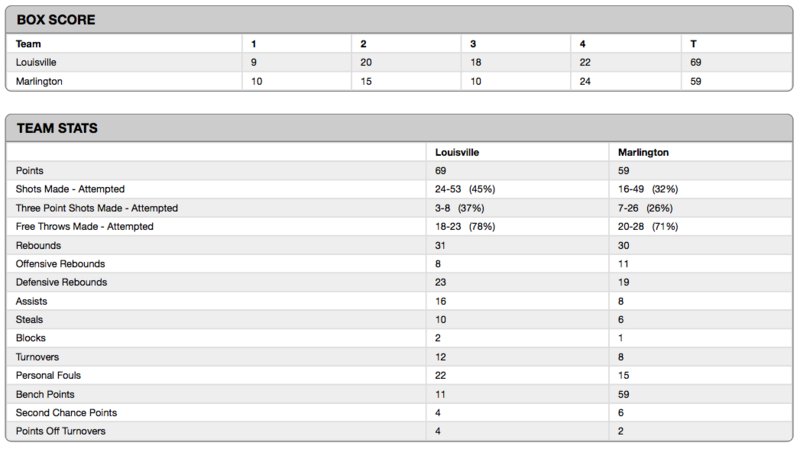 Louisville extended their lead to 47-35 at the end of the third and remained ahead by double digits at the final buzzer. 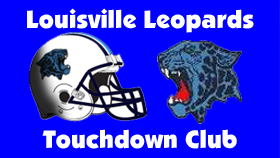 The Leopards out-shot the Dukes across the board. Louisville made 45% (24 of 53) of their shots from the field compared to Marlington’s 32% (16 of 49) performance from the floor. This included a 37% (3 of 8) to 26% (7 of 26) edge from beyond the arch and a 78% (18 of 23) to 71% (20 of 28) advantage from the charity stride. The Dukes (13-5, 8-3) were led by Alivia Lepley who dropped in a game-high 24 points and Robin Campbell who poured in 20 points. Campbell finished with a team-high 10 rebounds and 4 assists. Brooke Brodzinski also scored 6 to round out the top Marlington scorers. With the victory, the Leopards have defeated the Dukes 7 consecutive times and have now won 38 out of their last 40 head-to-head meetings overall. Louisville now leads the all-time series 66-17 with a 34-6 mark in games played at Marlington. The Lady Leopards are 19-1 when playing at MHS since 1998. UP NEXT: The Leopards will next host the New Philadelphia Quakers on Monday, January 30. JV will start at 6:00 PM and Varsity will follow around 7:30 PM. The Lady Leopards JV Team downed the Dukes 40-28 at MHS Saturday Evening. With the win, Louisville improves to 13-3 overall and 9-2 in conference play. Kayla Gibson scored a field goal in every quarter to lead the Lady Leopards with a game-high 11 points. Cassidy Kiko also scored 5 and the trio of Morgan Cole, Sydney Daniel, and Rachel Israel finished with 4 points a piece. 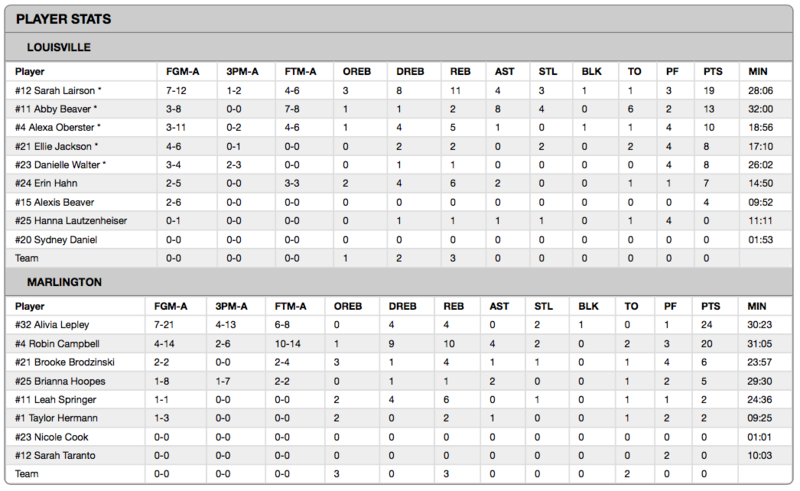 All in all, 9 different Louisville players scored during the contest. The Leopards shutout Marlington during the first quarter to lead 9-0. Louisville led 17-4 at the half and 32-10 at the end of three. The Lady Dukes nearly doubled their total from the first three quarters with an 18-point fourth quarter to finalize the score at 40-28. Marlington was led by Nicole Cook who finished with a team-high 10. Taylor Herman and Nic Lambden also scored 6 points each. LEOPARDS: Gibson 5 0-0 11, Kiko 2 1-2 5, Cole 2 0-0 4, Daniel 1 2-2 4, Israel 2 0-0 4, Agnone 1 0-0 3, Fresenko 1 1-1 3, Galentine 1 0-1 3, Rice 1 0-0 3. TOTAL 16 4-6 40. DUKES: Cook 5 0-0 10, Herman 2 0-0 6, Lambden 2 0-0 6, Hall 0 2-3 2, Taranto 1 0-5 2, Thompson 1 0-0 2. TOTAL 11 2-8 28.